Let’s face it rhinestones are simply the best materials for adding accents to gifts and personalizing clothing or jewelry designs but even the most creative run out of original ideas. If you think you have exhausted all design ideas, there is no harm in looking to others for inspiration! While Pinterest is one amazing way to gather DIY project ideas, fortunately there are great company’s like SwaggerSavvyDesigns out there that can give our creative juices a bit of a jump start! If you think you have done it all, have a look at some of these fresh, funky and fun designs and then follow our simple ‘how to’ guide to create similar projects. 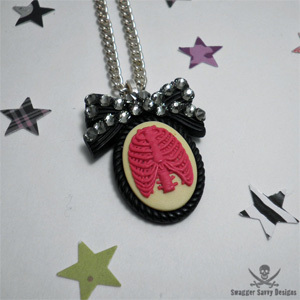 We absolutely love the idea of adding an element of the unexpected with this funky pink rib cage pendant. By adding the rhinestones to the bow in this design, the clash between the pendant design and the feminine bow and stones provides the ideal combination of strong punk chick and classic lady. Do you already own a pendant you want to bling and revive? Take some direction from the awesome designs of SwaggerSavvy. Often old pendants lack that bit of flash for a night out on the town so why not give them a makeover? This can also be the perfect way of upgrading some old jewelry you might neglect wearing since it just doesn’t capture your personality. Break out the glue gun and get ready to dress up your jewels. Once again this combination of femininity and funky design has left us wanting more! In addition to buying this one, you will likely be inspired to bling out some of your existing hair bows (and we can’t blame you!). This cool skull hair bow incorporates the funky trendy zebra design with some super cool deep red Swarovski rhinestones. The alligator clip backing makes it the perfect accessory for short or long hair. While we love this apron just as it is, adding some DIY bling may just be the added personalized touch you were missing. 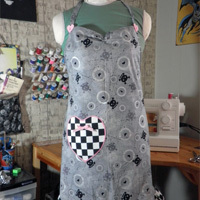 Use this funky frock as inspiration for creating your own. If you have some rather drab aprons in your pantry to choose from, consider adding ruffles, patches and of course rhinestones to jazz it up. Suddenly you’ll transform from drab to an amazing couture cook. Even if you live alone and have no one to view your fabulousness first hand, that’s what selfies are for right? ‘Wear your heart on your sleeve’ is how the story goes but after looking at this adorable pendant, we decided that you should wear your heart around your neck! This neat design inspires us to once again break out the rhinestones! 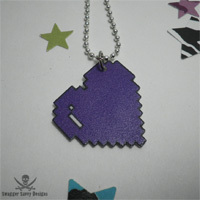 You can even make your pendant by hand if you would like to try your luck with shrinky dink plastic. Remember making these as a kid? The perfect craft to do with the young ones in your family, the necklace can be crafted and then once again a touch of bling and style can be added afterward. Feeling inspired? Getting started is a real breeze. Simply follow these basic instructions for application and you will be ready to show off your new jewels. One of the cool things about SwaggerSavvy is that often incorporate Swarovski into their designs. While we love all rhinestones, there is something extra special about these super shiny stones. There are many different colors and shapes to choose from so let your creative juices run wild and select those that appeal to you. Prior to gluing your rhinestones in place, map out the design you would like by placing the rhinestones around the pendant in the design of your choice. 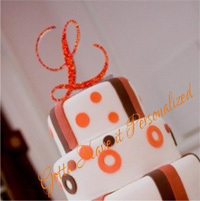 Once you are satisfied with the arrangement, you are ready to secure the rhinestones. There are several different options available to you for this but often a dab from a hot glue gun will do the trick. Who doesn’t love having new bling to show off? Once your glue has dried, simply pair your new look with your latest fashions and you will have everyone asking you for your guidance next time they feel like a glitzy DIY project. This entry was written by jasonp, posted on November 21, 2014 at 9:19 pm, filed under DIY Bloggers, DIY Rhinestone Decorating, Glue On Rhinestones, Hot Fix Rhinestones, How To, Swarovski Rhinestones, Tips, Who To Follow and tagged Designs, DIY, Projects, Rhiensstone, Savvy, Swagger. Bookmark the permalink. Follow any comments here with the RSS feed for this post. Post a comment or leave a trackback: Trackback URL.